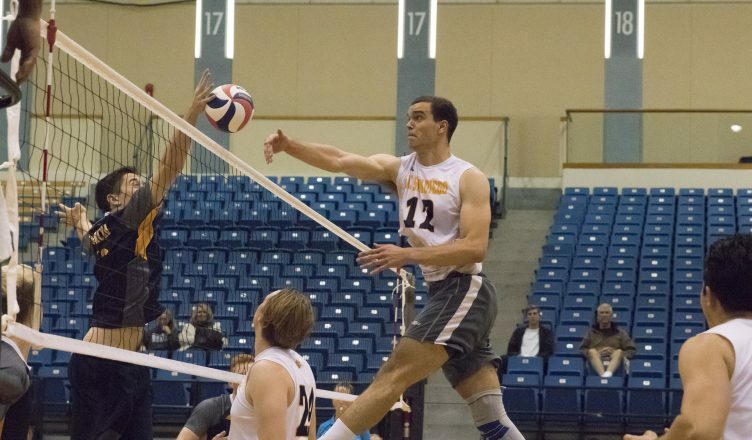 After posting two wins last weekend in the Wooden Classic Tournament in Los Angeles, the UC San Diego men’s volleyball team carried the momentum into its home opener Thursday night. The Tritons defeated UC Merced smoothly in three straight sets with scores of 25–12, 25–14, and 25–22. UCSD jumped out to an early 70 lead in the first period excelling in all aspects of the competition. Senior outside hitter, Luke La Mont tallied nine kills, four blocks, two digs, and one assist. Of his twelve attempts, La Mont committed zero errors listing a stellar .750 attacking percentage. The Tritons shared the glory as all but three members contributed points to the win. Junior outside hitter Nathan Thalken worked strategically on the outside with La Mont, padding all categories of his stats, totaling eight kills of his own, four digs, a pair of aces, and one block and an assist. UCSD played its best volleyball in the first period, leaving the Bobcats no room for rebuttal. Slick rotations on the offensive end and a towering defensive human barricade allowed the Tritons to secure the win. As a unit, the team averaged a .565 attack percentage on top of 16 kills altogether in the first period. Sophomore libero Ryan Lew showcased his acrobats all night with multiple full-extension digs in which he capped eight total, as well as four assists. Redshirt freshman Vlad Pesic recorded six kills, two aces, and successfully performed in his position as a middle blocker with a team-high of eight blocks. Appearing in the second set, redshirt junior opposite Luke McDonald wasted no time making his appearance known. McDonald collected nine kills in 12 attempts, four digs, two blocks, and one assist. Not to mention, senior setter Milosh Stojcic tallied 25 out of 39 total team assists. UC Merced applied pressure in the third set, taking the lead early and running with it; however, UCSD pulled away just in time to knock off the Bobcats in three. The Tritons improve to an overall 3–0 record and will face UCLA in RIMAC Arena on Tuesday, Jan. 16 at 7 p.m. with hopes of continuing their best campaign since 1996.